When you have missing teeth, replacing those teeth has to be a top priority. When your jaw goes without the right kind of pressure on it, such as from chewing, you end up losing bone density, and your jaw can slowly begin to erode. The longer you go without pressure on the areas that once held teeth, the more damage is done. One of the most comprehensive ways of being able to repair gaps in your teeth is to go through and get dental implants. Dental implants are simply not going to be the best option for everyone, but for most people, they are going to be a great solution. So long as you are not an active smoker, or have lost significant amounts of bone in your jaw, you should be a good candidate for implants, however, Dr. Mahar is going to be the best person to make that determination after a comprehensive exam. Dental implants are placed down into the jaw, so when you chew, your bone is continuously stimulated to remain strong and healthy. They are able to fill in gaps anywhere in the mouth, and they can help you avoid the sunken face look that many people notice after they get dentures. Dental implants allow you to go back to eating things like you did with your normal teeth instead of having multiple restrictions on what you can or cannot eat. Plus, dental implants, when taken care of properly, are able to last you the rest of your life in many circumstances. We can even anchor dental bridges using implants! When getting dental implants, they do take a bit of time. You first need to have the teeth removed and have the gums healed up. From there, your implant is placed into the jaw bone. 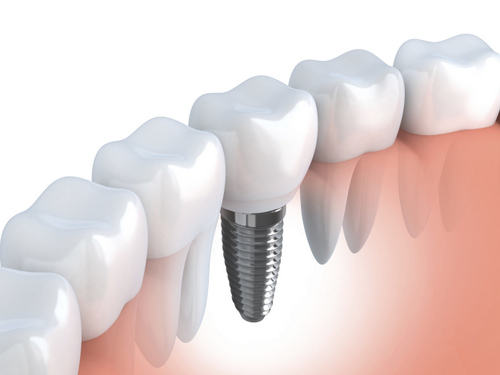 After three to six months to heal, you are then able to get a post put into the implant. When the post is secure, you then get a crown put on the top, and the tooth then functions in the same way that a natural tooth would function. You can use one implant for a single tooth or small partial, or you can use a series of implants to be able to cover larger gaps or entire arches. If you are looking to find out more about dental implants, give us a call today at (315) 766-2770, and let us take a look at your mouth. Once we see which teeth you are looking to replace, we can talk to you about getting you started if your mouth is a good candidate.